The 18-hole Ballantrae Golf Course at Santa Lucia River Club in Port Saint Lucie, FL is a private golf course that opened in 1993. Designed by Jack Nicklaus, the course is the striking centerpiece of a breathtaking 402-acre sanctuary. 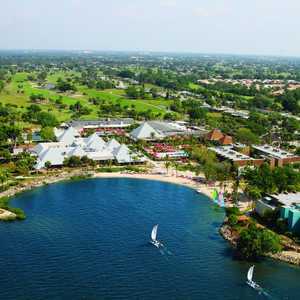 Club Med Sandpiper Bay is an all-inclusive resort that offers everything from horseback riding to golf, and the beaches of the Treasure Coast are conveniently only 20 minutes away. The 18-hole championship golf course is a classic Florida layout. Though you may not have to contend with elevation changes, there are plenty of strategically placed sand bunkers and water hazards to keep the golf course challenging. The 18-hole Dye Course at PGA Golf Club in Port Saint Lucie, FL is a public golf course that opened in 2000. Designed by Pete Dye, Dye Course at PGA Golf Club measures 7221 yards from the longest tees. The 18-hole Legacy Golf & Tennis Club in Port Saint Lucie, FL is a private golf course that opened in 1984. Designed by George & Jim Fazio, Legacy Golf & Tennis Club measures 7023 yards from the longest tees and has a slope rating of 143 and a 74. The 18-hole Nicholas Golf Club in Port Saint Lucie, FL is a private golf course that opened in 2001. Nicholas Golf Club measures 7025 yards from the longest tees and has a slope rating of 135 and a 79 USGA rating. The 18-hole Palmer Course at The Tesoro Club in Port Saint Lucie, FL is a private golf course that opened in 2005. Palmer Course at The Tesoro Club was designed by Arnold Palmer. The 18-hole Ryder Course at PGA Golf Club in Port Saint Lucie, FL is a public golf course that opened in 1996. Designed by Tom Fazio, Ryder Course at PGA Golf Club measures 6967 yards from the longest tees. The 18-hole Savanna Club Golf Course in Port Saint Lucie, FL is a semi-private golf course that opened in 1988. Designed by Charles Ankrom, Savanna Club Golf Course measures 3792 yards from the longest tees and has a slope rating of 98 and a 59. St. Lucie Trail Golf Club (formerly known as PGA Country Club) is a traditional course with small, fast greens. Water comes into play on 10 holes with more than 80 green and fairway sand bunkers that provide added challenge to the narrow fairways. This Treasure Coast golfing jewel embraces the traditional values of golf course architecture emphasizing shot value, variety and dramatic effect. Meandering through an 800 home residential community, St James offers 4 sets of tees for individual playing ability and a challenging round for all levels. The 18-hole Wanamaker Course at PGA Golf Club in Port Saint Lucie, FL is a public golf course that opened in 1996. Designed by Tom Fazio, Wanamaker Course at PGA Golf Club measures 7079 yards from the longest tees. The 18-hole Watson Course at The Tesoro Club in Port Saint Lucie, FL is a private golf course that opened in 2008.